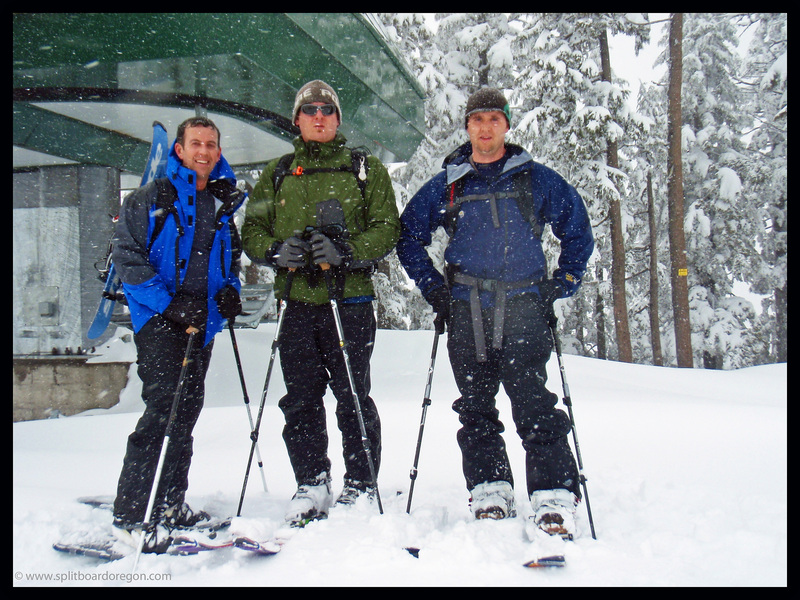 Andy, Todd and I headed out from work at 2:30 for the 4th annual April after-work Willamette Pass dusk patrol. The weather was stormy, but we had our hot coffees in the truck . 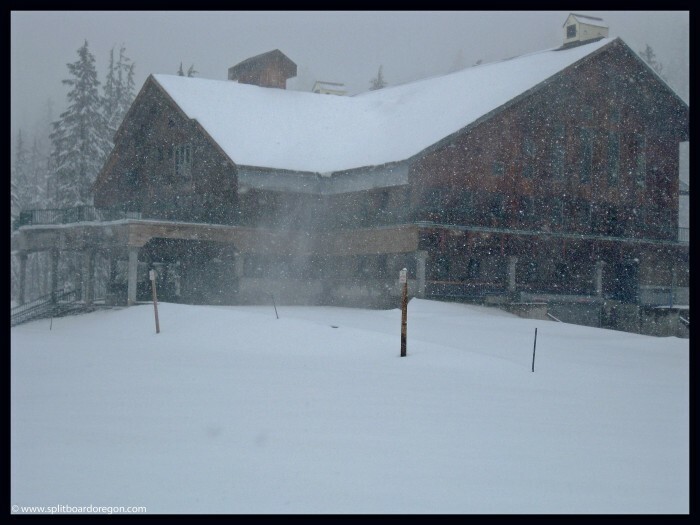 The lifts had been closed for more than 3 weeks, and low snow levels were in the forecast all week long. 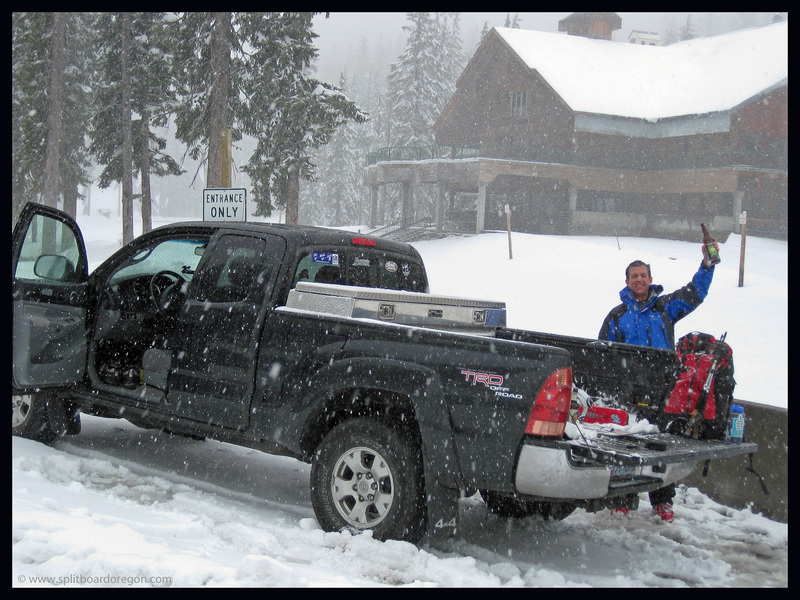 We were hoping for a similar day to one we’d had during our April 2008 dusk patrol where powder was everywhere! After a brief stop in Oakridge, we arrived at the pass and parked off the road near the gate. 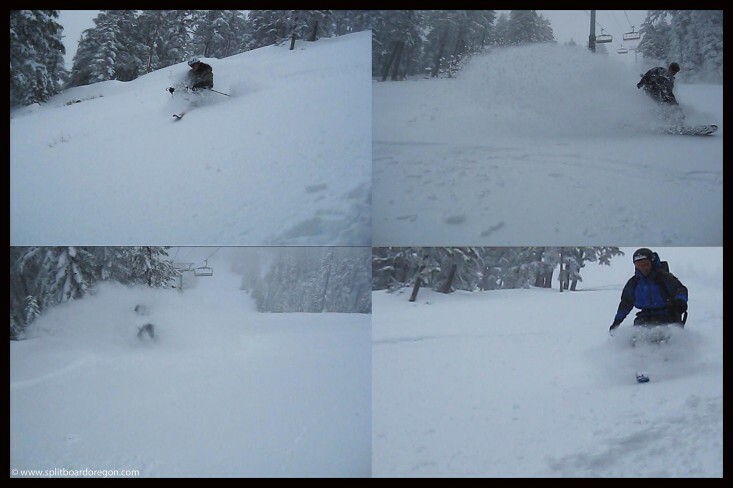 There was about 15 inches of fresh from the last day and a half in the parking lot and it looked like it would be good! Nobody was around, but one other car pulled up as we were getting ready to take off. We shouldered our packs and started skinning up the soft snow on By George. We made pretty good time on the up track…. 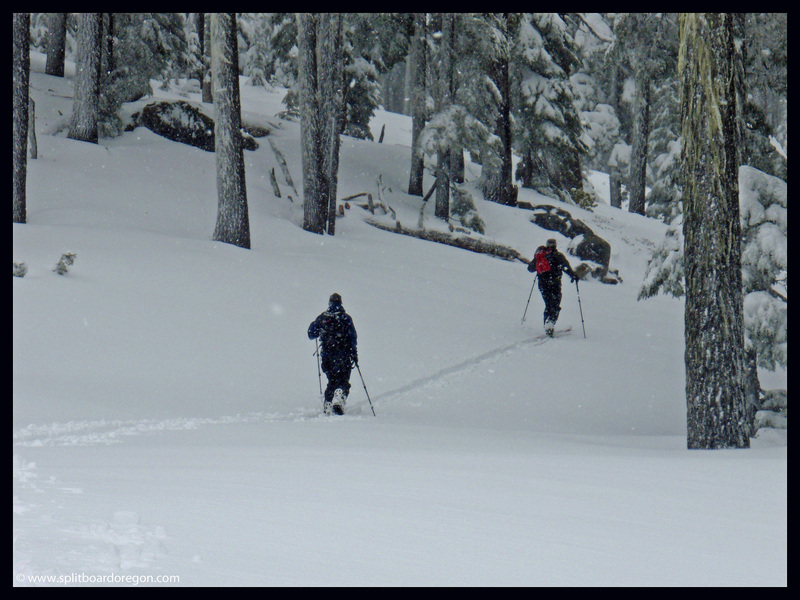 Within about a half an our, we had left By George and were skinning up Timbur, which had better coverage than it did for most of the season – go figure! We reached the top in about an hour, not bad for the 1500 vertical feet of climb and having to break trail. We sat around for a bit at the top of the EPA, snapped a few photos and enjoyed the nasty weather. A snowblader, a tele-skier and a splitboarder! The wind was raging pretty good, so we ripped skins and headed back down to the beers waiting at the truck. I saw a really nice cornice that I wanted to jump at the top of Success, but it was pretty wind loaded. Actually, really wind loaded. One good stomp produced this slab, which was about 4 to 8 feet thick at the crown, but only ran about 100 feet. 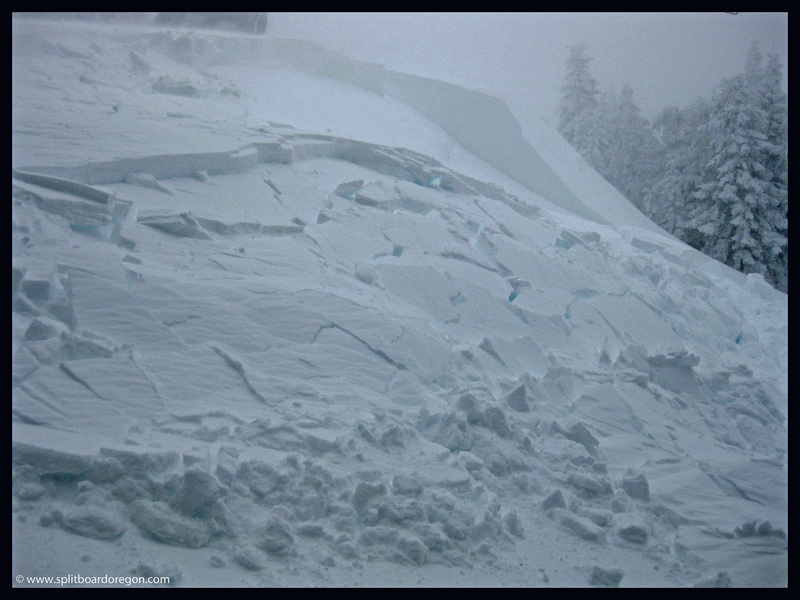 Lots of wind loading from the westerly windward slope was the cause…. The ride down Success was pretty sweet. Freshies the whole way down and nobody cared at all that it was a little heavy – it was late April after all! We didn’t shoot any photos on the way down, but did take some video. The following pic is a number of stills pulled from the videos we shot….. The snow was still light enough to get several face shots. 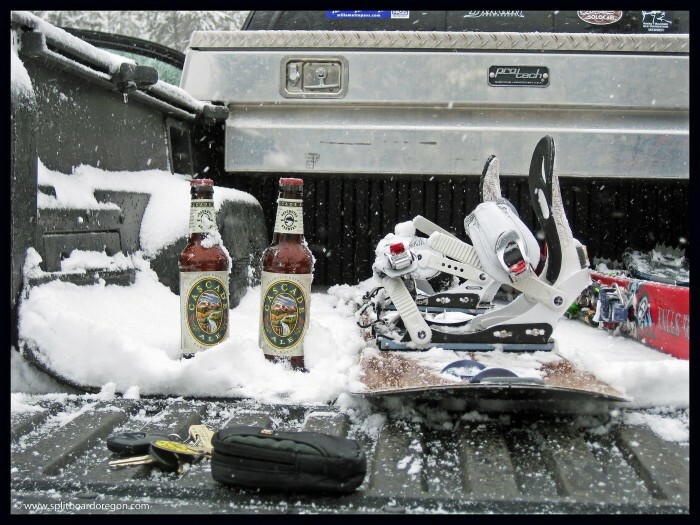 Once down at the truck, we found our “friends” in the snow and proceeded to almost get frostbite while enjoying a frosty beverage. It was cold and snowing hard – and it felt good. Andy & Todd enjoying a cold one! We stood around at the truck drinking the cold beers and feeling pretty cold ourselves. Drinking a fresh cold beer at the end of a Willamette Pass Dusk Patrol is always something I look forward to! 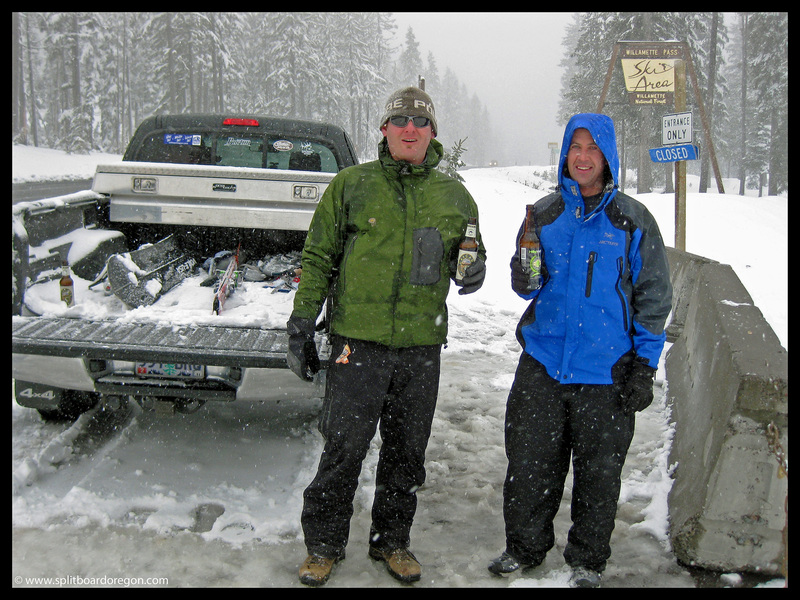 After the beers were gone, we loaded into my pickup and headed back down the mountain. 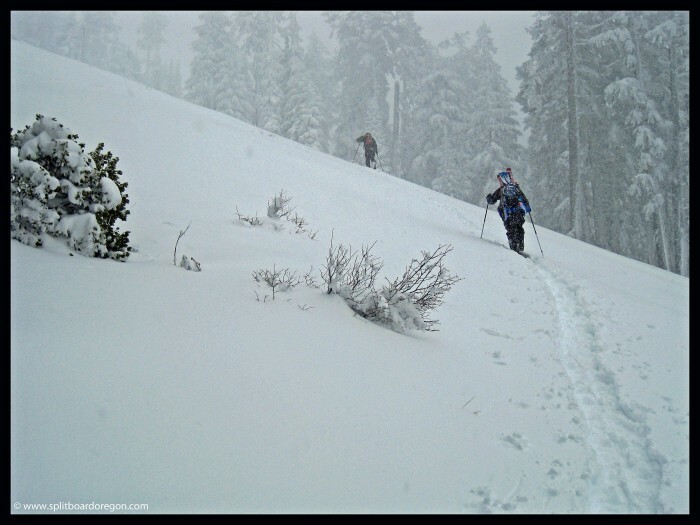 The brief return to winter made me wish the powder season would never end, but corn season will be here soon! Before we pulled away and headed for home, I snapped this shot of the lodge in mid-winter glory…if I had half a brain, I would have went back up for another run the next morning…….